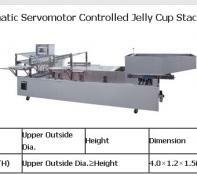 SP-GD Automatic Servomotor Controlled Jelly Cup Stacking Machinete: The aluminum stacking mold will be designed specially according to the cup size and the cup height should be smaller than its upper outside diameter. Normally, one set cup stacker will be just suitable for one size cup. Our company is specialized exporter, manufacturer and supplier of SP-GD Automatic Servomotor Controlled Jelly Cup Stacking Machine in 中国.